A crucial pipeline that carries gasoline and other fuel to the U.S. East Coast has been shut down for the second time in two months, bringing a new threat of price hikes at the pump. 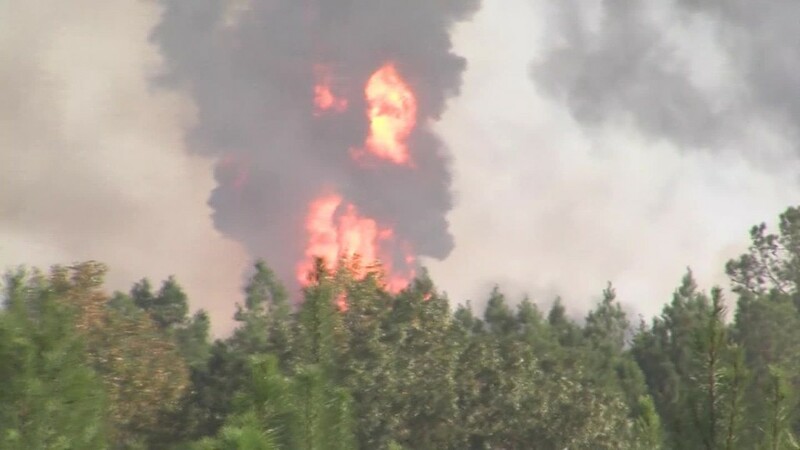 A fire broke out Monday afternoon along a section of the Colonial Pipeline in Alabama, killing one person and injuring five others, the pipeline operator said. Images from the scene showed a massive plume of flames and smoke towering over nearby trees. The blaze, which continued to rage late Monday, prompted the closure of the pipeline, which stretches from Houston to New York and provides gasoline for 50 million people, according to company estimates. AAA said the shutdown is likely to cause gas prices to rise in the southeastern and mid-Atlantic regions of the country. In early September, part of the pipeline was closed for nearly two weeks because of a huge gasoline leak. That caused gas prices to spike by 28 cents in Georgia and 17 cents in Tennessee, according to AAA. "We were just beginning to recover from the gas price hikes we saw from the pipeline closure in September," said Garrett Townsend, an AAA spokesman in Georgia. "The explosion will at least temporarily put a halt to the pump-price dip we've experienced over the past 30 days." Monday's fire started several miles from the area in Shelby County, Alabama, where the September spill happened. The blaze erupted after a crew working on the pipeline hit it with a trackhoe, causing gasoline to ignite. The Colonial Pipeline has two main lines: one for gasoline and another for things like diesel and jet fuel. In September, Colonial reopened the diesel and jet fuel line as soon as it determined the leak was coming from the gasoline one. However, the gasoline line remained off line for almost two weeks until the company could build a temporary bypass.